A post about inbreeding depression in which I make no reference to the movie “Deliverance.” « Nothing in Biology Makes Sense! So why would inbreeding result in depression sometimes, but not others? This is where evolutionary theory comes in. Most mutations are either neutral (having no fitness effect) or deleterious. Also, there is correlation between the recessiveness of a mutation (its propensity to affect phenotype when it is heterozygous) and the strength of its deleterious effect (Greenberg and Crow 1960). What that means is that most highly deleterious and lethal mutations are recessive (i.e. an organism needs to carry two copies of it in order for its negative effects to be felt). This has major consequences for natural populations. It means that highly deleterious alleles can be maintained in populations at low frequencies because natural selection can’t effectively select against them, and as a result a very large number of different, rare deleterious alleles accumulate in large populations. To understand what I’m talking about, consider a single gene with two variants. The first variant is functional and occurs at a frequency of p=0.99, and the second is a recessive lethal variant at a frequency of q=0.01. The probability of an individual born in a large, randomly mating population receiving two copies of the recessive lethal (and thus dying) is 0.0001. The probability of an individual receiving only one copy (and thus being perfectly healthy) is 0.0198. So one in ten thousand individuals are expected to die as a result of this allele, but 198 in ten thousand individuals happily carry it around with no ill effects. Under these circumstances, the ultimate fate of the allele is determined by the relative strengths of selection and genetic drift, but that is a different story. So, recessive deleterious alleles can arise and persist in large numbers, but low frequencies in natural populations and most individuals in any given population harbor a number of these alleles in heterozygous genotypes without detriment. When large populations begin to decline and become fragmented, however, things change. Individuals that survive this decline carry their recessive deleterious alleles with them. Because the population is now much smaller, these alleles are now at a much higher relative frequency. If in the above lethal recessive were now at, say q=0.1, the probability of receiving two copies would be 0.01, with 100 out of every 10,000 individuals dying. Now if we consider that most individuals arrive in this small population carrying many non-lethal recessive deleterious alleles, the probability of any given individual winding up homozygous for fitness reducing alleles becomes much higher, and the average fitness of the population becomes markedly lower. So it becomes clear how island populations, such as the Chatham Robin might avoid inbreeding depression. If their populations were always extremely limited and isolated, deleterious recessive alleles might never have had the chance to reach high frequencies, but instead become purged by selection very rapidly after mutating into existence. The original purpose of this post was to cover some recent research, I just got a little out of hand with the background. So now I’ll get to the paper I read that started me on this whole topic. 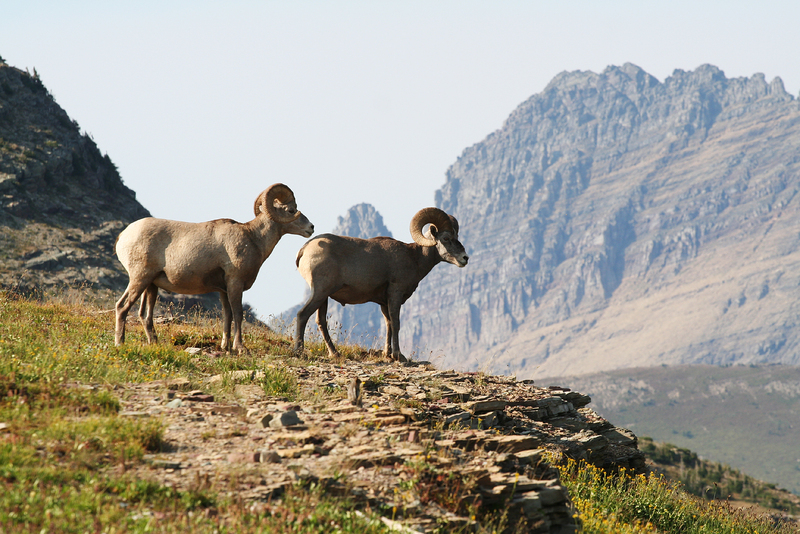 A sad example of inbreeding depression challenging conservation efforts is that of the bighorn sheep (Ovis canadensis). 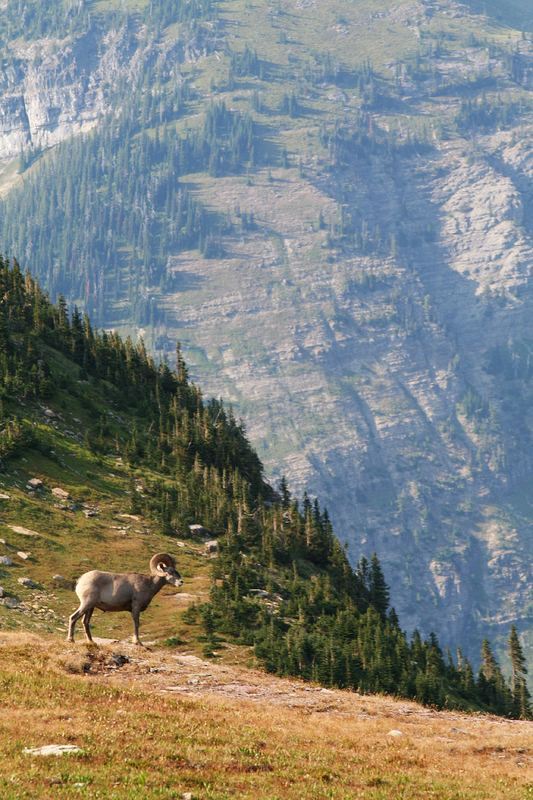 Bighorn sheep declined enormously throughout the 20th century as a result of a variety of factors, and many of their populations are now small and isolated. In the ’70s it was recognized that some of these isolated populations were experiencing severe inbreeding depression and an attempt to “genetically rescue” a population at the National Bison Range (NBR) by translocating individuals from other populations began. The idea behind genetic rescue is two-fold. First, it is thought that the introduction of individuals from outside the isolated population will give genetic diversity in the population a bump and thus “mask” recessive deleterious mutation. Second, in some cases, heterozygosity itself is observed to have fitness advantages, although that can be highly dependent on the context of the heterozygosity. Genetic rescue also carries the risk of “outbreeding depression”, which can occur when populations are so divergent or locally adapted that hybrid offspring have intrinsic genomic incompatibilities or intermediate and unfit traits. In the case of the NBR population, however, genetic rescue appeared to be a success. Individuals with outbred pedigrees (they have tracked the parentage of all individuals in the population since before introductions began) showed increases in fitness and longevity. In this paper, by Miller et al. (2012), the authors asked what the genomic underpinnings of the success were and try to understand which of the mechanisms might contribute to it. I won’t get too into the details of the study, but the authors examined patterns of variation at 195 genetic loci from 219 individuals. These individuals were sampled from 1988 to 2008. Using these data, Miller et al. applied some pretty fancy Bayesian statistics to do a couple things. First, they calculated a “hybrid index”. This index directly quantifies the proportion of migrant and resident genome present in each individual. Next they examined correlations of genotype frequencies at individual loci with the hybrid index, and compared them with neutral expectations. The manner in which individual loci deviate from the pattern predicted by the overall hybrid index can be informative about whether, and how natural selection is responding to the attempt at genetic rescue. They examined trends in genomic admixture over time by analyzing the amount of homozygosity and interpopulation heterozygosity. They also compared the hybrid index to longevity and number of progeny and looked for effects of specific loci on these factors. In general, the authors found that the amount of migrant ancestry correlated with longevity and fitness and they found that a few loci seemed to be especially strongly correlated with fitness increases. They found a wide variety of patterns of genotype frequencies at specific loci, but the prevailing pattern was directional selection. No specific sections of the genome seemed to be particularly implicated in the rescue. Strangely, they found a substantial amount of apparent directional selection for resident alleles. This conflicts with other results showing a strong general relationship between migrant alleles and fitness. This could be the result of some resident alleles being highly locally adapted, but the authors lean strongly away from this conclusion, suggesting instead that it represents a statistical artifact. They point to the observation that, over time, nearly all loci show trends toward increasing homozygosity of migrant alleles. All together, these data suggest that the genetic rescue was highly effective and has proceeded by masking deleterious mutations, or introducing alternative beneficial migrant alleles, but not simply by virtue of increased heterozygosity. Evidence of outbreeding depression was lacking. Admittedly, this is only tangentially related to my field, but I found this paper fascinating in that it is the first I’ve read that tries to examine the genomic architecture of this important phenomenon. As the authors note, similar analyses have been conducted in the past, but they are often directed at specifically trying to find loci that cause incompatibility between populations in the context of speciation, rather than examining this complex phenomenon. I have one final thought on the effectiveness and importance of genetic rescue attempts. This is that inbreeding depression is largely a result of rapid declines in population size and not necessarily of small size per se. Do attempts to rescue populations hinder the process of purging high frequency deleterious alleles, and is this something that we should take into consideration? Certainly the extinction of wildlife populations is something we should avoid at any cost, but if we assume that inbreeding depression is a temporary phenomenon and not a chronic one, is it possible that our treatment could increase the vulnerability of populations in the long term, if say, money or public support should run out for persistent human-aided migration? That’s all for now. And if you’ve read this far, I give you this gift, I won’t get offended if you think my parting thought is hopelessly idiotic. Jamieson IG, GP Wallis, JV Briskie. 2006. Inbreeding and endangered species management: is New Zealand out of step with the rest of the world? Conservation Biology. 20(1):38-47. This entry was posted in conservation, ecology, genetics and tagged Bighorn sheep, inbreeding depression.